The government is going full throttle to implement the Aadhaar-based direct cash transfer scheme. This will be a landmark shift in the way government benefits and subsidies are distributed. 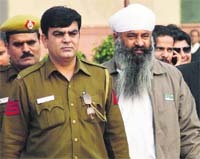 Former Uttarakhand Minorities Commission Chairman Sukhdev Singh Namdhari had fired at Ponty Chadha�s younger brother, Hardeep Singh, during the gun battle outside Chadha�s farmhouse in Delhi on November 17 in which both brothers were killed, the Delhi Police told a local court today. A curfew has been imposed in Sirsa town after more than 12 persons were injured in clashes between followers of Dera Sacha Sauda and some anti-dera organisations today.